Similar to leasing an automobile, an aircraft lease involves the use of an aircraft for a specified period of time without transferring the title. The owner of the aircraft (the lessor) maintains legal ownership but the lessee holds possession of it through the duration of the lease. Leasing can be a more attractive option than purchasing depending on the utilization of the aircraft and how it impacts the ability to take advantage of any available tax benefits. Many people choose to lease an aircraft because they are not able to take advantage of the tax benefits that ownership can provide. Aircraft used for business purposes can provide tax benefits, but personal use does not. Understanding how the aircraft will be utilized can often be one of the primary driving forces in the decision to lease or purchase an aircraft. Aircraft leases are regulated by the Federal Aviation Administration (FAA) under the Federal Aviation Regulations (FARs). There are several ways to lease an aircraft, all with their own unique advantages and disadvantages. We recommend consulting with an aviation advisor to determine the lease type that is best for you. In the event damage was to occur to the aircraft during the lease, unexpected obligations may apply to the lessee. To avoid any uncertainty, a well-drafted lease should clearly outline each party’s responsibilities in the event the aircraft does sustain physical damage during the lease term. Another important area is to understand the terms for the lease return process. Consulting with an aviation advisor can help you answer any questions you may have about a lease agreement. Aircraft leasing and chartering are both practical and flexible alternatives to flying on commercial airlines. Both certainly offer a more comfortable flying experience on a more reliable and convenient schedule. Similar to deciding to purchase, the option to lease an aircraft becomes more attractive when your annual travel needs exceed a certain level or when availability of charter aircraft might be an issue. Leasing provides the ability to have direct control over the aircraft and its availability while also assuming the responsibilities of operational control. With private aircraft charter services, you essentially have access to an aircraft on a trip-by-trip basis but availability is not guaranteed. The decision to lease involves a long-term commitment and allows the lessee to have full utilization and operational control of the aircraft. The advantage to private charter is the ability to access a variety of aircraft models and sizes, so you can select the aircraft that best meets the requirements of each individual trip. With more than 70 years of combined aviation experience, Essex Aviation has worked with a variety of financial institutions, banks and other companies to provide their clients with aviation financing options for both private owners and public or private corporations. The new options available in the aircraft leasing market today can provide certain benefits that were not historically available under traditional leasing structures. Consulting with an aviation advisor will allow you to review all the options available and determine which may best meet your needs and desires for the aircraft you are considering. Aircraft leases should have specific terms and conditions detailed in the lease agreement that will outline the requirements and processes to be followed by all parties upon the return of the aircraft at the end of the lease. It’s recommended that you consult with an aviation advisor as you’re negotiating lease terms and conditions when entering into the lease and also having them work with you when going through the lease return process. An aviation advisor will be able to assist and advise you during negotiations concerning the lease return inspection requirements. Additionally, during the final aircraft lease return process, the expertise of an aviation advisor can often provide alternative or cost-effective ways to resolve certain issues while also satisfying the provisions and terms of the lease return process. 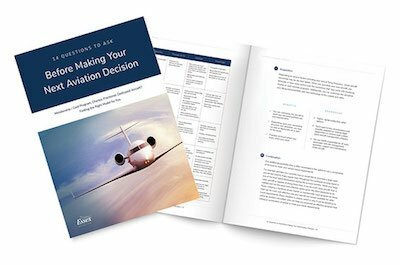 These advisory services can greatly reduce your organization’s cost burden of unexpected return condition requirements or issues raised at that time with the aircraft. Essex Aviation Group, Inc. specializes in advising and representing clients with various aviation services including new and pre-owned aircraft acquisitions, new aircraft completion management, aircraft leasing and more. For more information about any of our services, please contact us. Editor’s Note: The following information is featured in an article that originally appeared in Business Aviation Magazine.